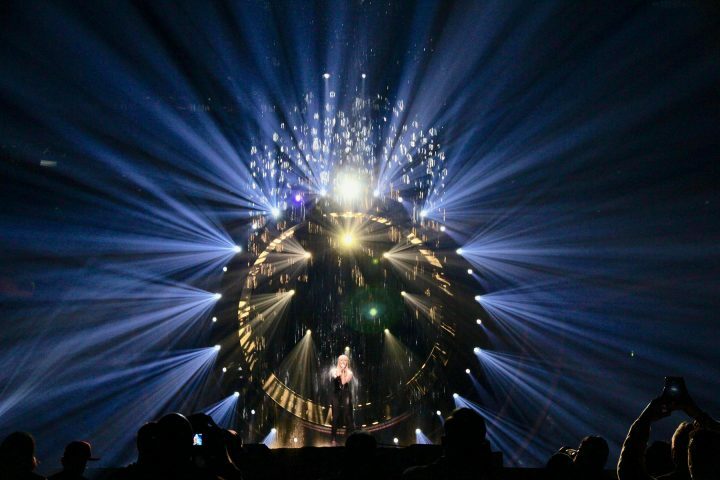 Slovenia is a small and perfectly formed country with a population of 2 million and replete with lots of entertainment-orientated talent including in lighting design, as LD Ziga Kranjne proved when he lit the 7th edition of Slovenia’s Got Talent. 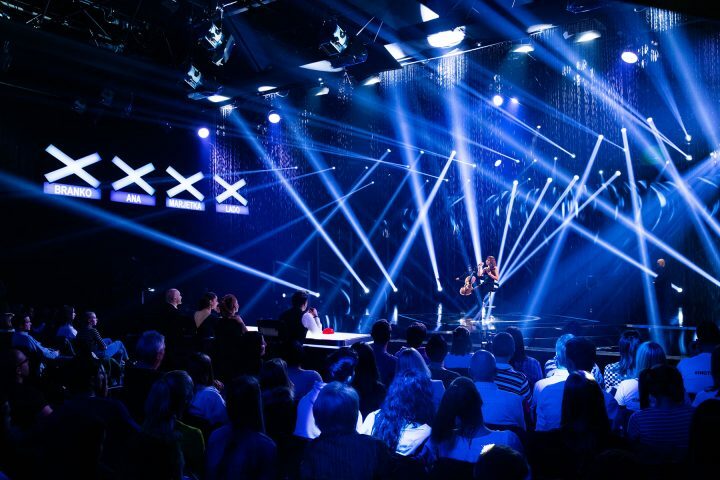 The series was recorded for broadcaster POP TV in Studio 4 of their complex in Ljubljana, and Ziga’s rig utilised Robe moving lights for its core elements, including MegaPointes, Spiiders, LEDWash 800s, Pointes, MMX Spots, CycFX 8s and a BMFL Blade… all supplied by Event Lighting, a leading Slovenian rental company for which he works full time as an LD and programmer. Ziga has lit all the SGT shows since it started in 2010 and for this one, he worked closely with set designer Milan Mukadin who was also the video designer. They took some of the most popular aesthetic moments from last year’s show and reimagined them for this one, adding new and original visual ideas to keep things moving and looking different. 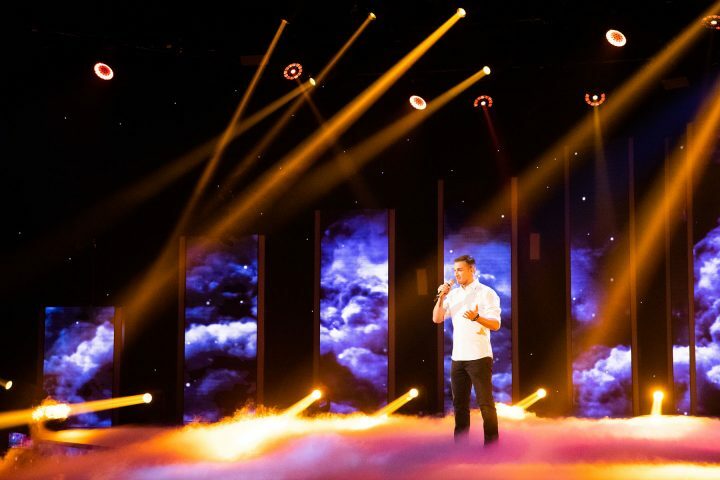 There was a wide range of artists appearing, so the studio design which kicks in for the semi-finals and final sees 35 hopefuls battle it out, and must be very flexible. The auditions before this are staged in a theatre venue with no moving lights. Ziga utilised all the studio’s available lighting positions, and his first choice of moving lights – for the last year – has been MegaPointes! Eighteen were rigged on the roof following the curvature of the main video screens. He comments that it’s a “brilliant” luminaire, although admitting that it was slightly over-bright for this studio environment! He made extensive use of the animation wheel in the fixtures and also gobo effects, with some special ones created to combine with low fog. He’s used MegaPointes since the first batch was purchased by Event Lighting… and he loves them! Eight MMX Spots – a reliable favourite of Ziga’s – were positioned in the roof, where they were perfect for backlighting dancers and props and for use as specials. Another two MMX Spots on the floor at the front of each side of the performance area provided low front cross light for singers, and their animation wheels and gobos were also used extensively. A total of 16 x Pointes were divided 10 on the deck and six on the roof, and used for effects, ad bumpers, intros and special lighting scenes at the start of the show. 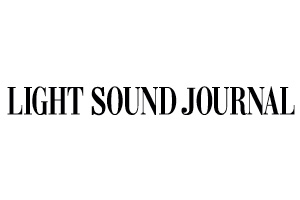 “Pointes are one of those ‘essential’ lights to have on a rig if you need to be fully versatile” he commented. The eight Spiiders were pixel-mapped for effects in addition to being used for conventional washing of the performance space and for support lighting on groups of dancers. They worked in conjunction with the 12 x LEDWash 800s providing rear and front wash light. Extras included the 12 x CycFX 8 units, located on the stage and used to light props and for assorted disco effects, and “were great for interacting with some of the dance acts”, as Žiga observed. A single Robe BMFL Blade was used as a manually operated back follow spot… with dimmer and colours controlled by Ziga via his grandMA2 lighting desk. He used some other lights on the show including small beam lights around the back of the audience, LED strobes/wash lights and Sunstrips. In total there were 14 DMX lines fed into the console, running with OnPC and a Command Wing for backup and controlling the Madrix system – programmed by Ziga’s Event Lighting colleague Matija Kacin – used for mapping the video content to the screens and some of the LED luminaires including the Spiiders. A selection of the dance act shows were run to timecode while others were operated fully manually. Ziga, Matija and Milan have all worked together on this show for the last five years and enjoy a great creative chemistry. 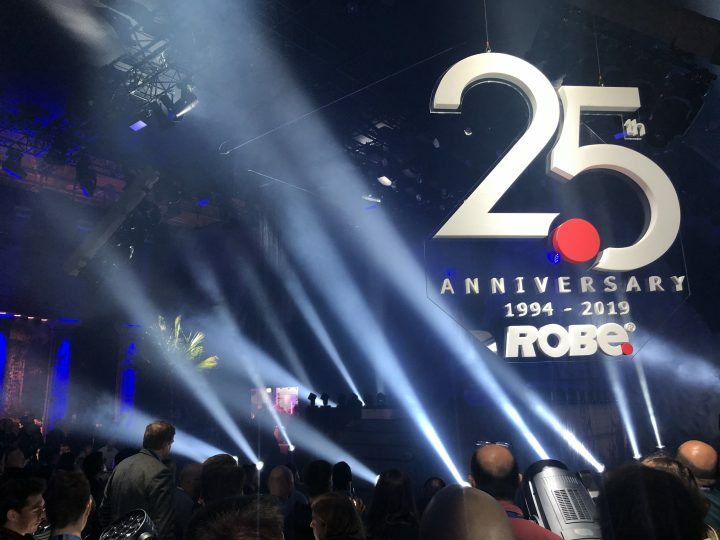 Ziga has lit the show enough times to know the basic requirements well, but the main challenge for lighting each series is the amount and intensity of live programming needed in a short timeframe to accommodate 7 new and totally diverse performances – from bands to acrobats – per week. “I enjoy the buzz of this, and I definitely need the adaptability of the Robe fixtures” he confirmed. “Using these I have multiple options and can create many different looks quickly and easily”. Ziga is well acquainted with the technology, having started using Robe products around 12 years ago. “For me Robe is the best moving light brand of the moment” he concludes.